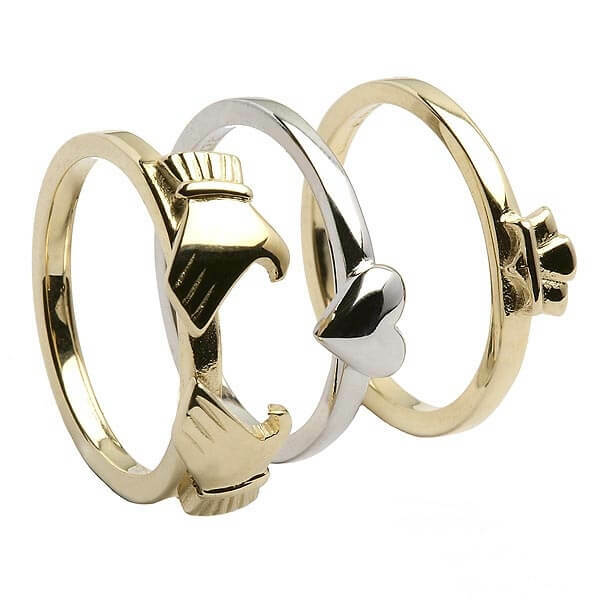 This cleverly designed Claddagh ring, is actually three separate rings which fit perfectly together to look like one single band. 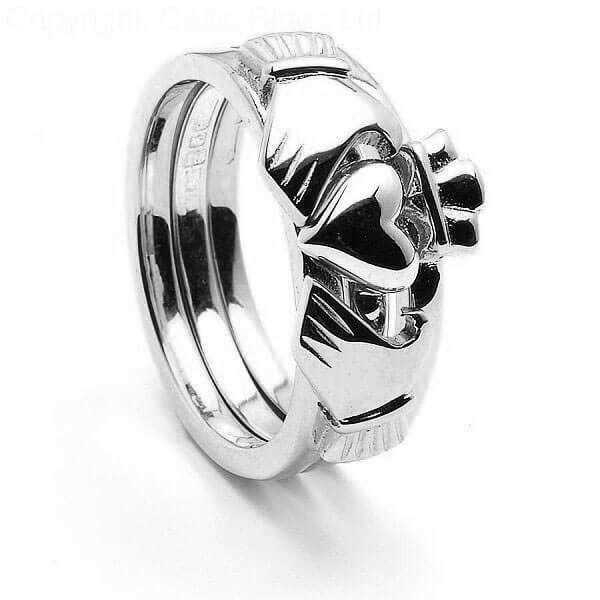 The hands and the crown of the Claddagh are formed from yellow gold, while the center band featuring the heart is made from white gold. 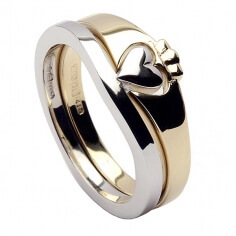 Choose from 10K or 14K gold, your ring will be hallmarked by the Dublin Assay office as proof of quality. 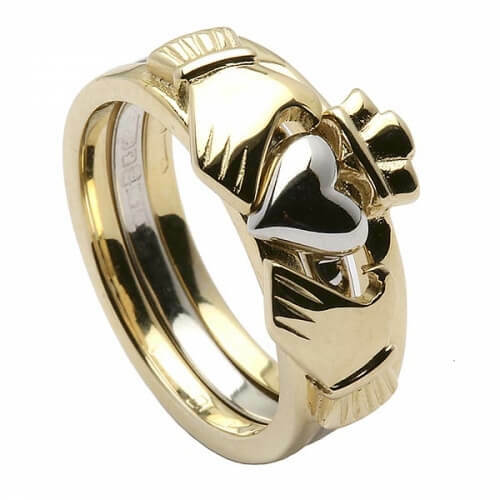 When Cuchulain was still a young Irish warrior, he sought out to marry the maiden Emer; however, her father forbade the marriage on the conditions that her older sister must marry first, and she must marry someone who had proven themselves in battle. 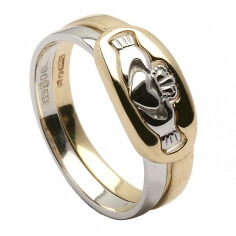 This caused Cuchulain to seek out Skatha, who lived in the land of the shadows or Isle of Skye. On the way to the Skatha’s land, he had to face many perils: thick forests and empty plains. He came upon a young man in a thick swamp known as the Plain of Misfortune. The man gave him a wheel, and he told him to roll it and follow it where it goes. Cuchulain did as he was told, and the wheel lit up with fire and beams of light, which allowed him to follow it out of the swamp. He then had to battle the beasts of the Perilous Glen, and after that he came upon the Bridge of the Leaps. Just beyond that was Skatha. At the bridge he came across others who wanted to train with Skatha, but no one knew how to get across the bridge. It was like no other being extremely high with a deep pit full of sea creatures, and if anyone landed on the bridge, it would throw them off. Cuchulain decided to rest and prepare for a way to tackle the bridge. Then he attempted to cross the bridge three times. On the third try he leapt to the center, and before the bridge could rise up, immediately leapt to the end. He made it to the door of Skatha’s fortress. Skatha was impressed with Cuchulain and agreed to take him on as a pupil. She taught him the art of war and how to use the Gae Bolg, which was a weapon thrown from the foot that would kill by inserting barbs all across a man’s body. A time came when Skatha had to engage in a war with Princss Aifa and her people. In order to keep Cuchulain away from battle she gave him an herb that would cause him to sleep for one full day, but instead, it only lasted one hour. When he awoke, Cuchulain grabbed his weapons and rode into battle. He forced Aifa to battle with him, but not before asking Skatha what Aifa valued most, which she told him were her chariot, horses, and charioteer. Aifa turned around to look, and Cuchulain disarmed her and threw her over his shoulder to bring to Skatha. He set Aifa before Skatha and demanded she make peace with Skatha, or he would cut her throat. She agreed to the terms and became friends with Cuchulain, and later she would bear his son.